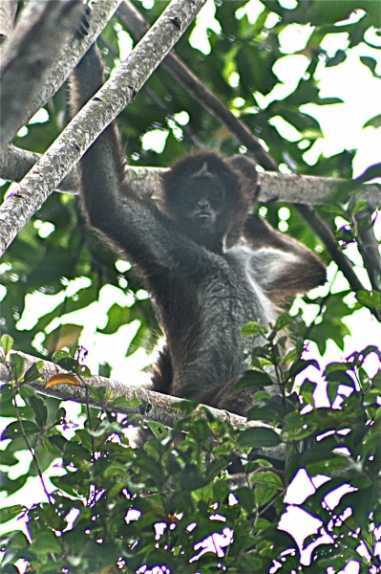 Conservationists have discovered a colony of rare brown spider monkeys in Colombia. The brown spider monkey (Ateles hybridus) is among the world's 25 most endangered primate species. The population discovered in the Selva de Florencia National Park by Wildlife Conservation Society (WCS) researchers and Colombia's National Parks Unit are made up of two different sub-species. A. hybridus hybridus lives on one side of Magdalena River in the protected park in central Colombia and A. h. brunneus on the other. Each subspecies is threatened with extinction, but A. h. brunneus is in more danger because until now none of its colonies lived in national parks. Dr. Julie Kunen, WCS Director of Latin America and Caribbean programmes, says, "This exciting discovery of brown spider monkeys in Selva de Florencia National Park emphasizes the importance of protected areas to safeguard wildlife - even for previously unknown species. "The fact that the species was found in a protected area gives conservationists hope that populations will be safeguarded and can perhaps even grow in number." In 2005, when the national park was created, it was thought that the only A. h. brunneus brown spider money in the area was a captive money living with colonists. Investigations by the WCS, Universidad de Caldas, Regional Autonomous Corporation of Caldas, Universidad Nacional, energy provider ISAGEN, and Instituto von Humboldt failed to find the species. But towards the end of 2011 a village farmer in El Silencio alerted the authorities and researchers from WCS and the National Parks Unit spotted at least two brown spider monkeys. The park is on the southern edge of the species' habitat, which means it is at increased risk. WCS is investigating the numbers and status of the brown spider monkeys and how to restore its habitat so it can be linked with more northerly populations. The WCS's work in Colombia, which is mainly focused on preserving ecosystems in the central Andes area, is partly financed by the United States Fish and Wildlife Service's Wildlife Without Borders. WCS exists to save wildlife and wild place across the world, using science, conservation, education and the management of the world's largest system of urban wildlife parks, which is led by Bronx Zoo. For more details, visit the WCS website.